Even if it’s only Apple Music or Netflix, the odds are high that you subscribe to some service. And, the odds are even higher that you’ve never needed to unsubscribe. When you do, though, it’s not exactly obvious how to get out of these subscriptions. But if all services and all developers make it temptingly easy to add subscriptions, getting rid of them is easy too —once you know where to look. We will never tell you that Apple Music is anything but a bargain. We’ll never say Netflix isn’t worth it, either. Yet just by taking those two, you’re spending a minimum of $13.99 per month. That’s if you qualify for the Apple Music student fee of $4.99 per month and you’re willing to put up with Netflix’s poorest picture quality. More practically, you’re going to be spending at least $23 per month. It doesn’t stop being a bargain, but it does add up. Over a year you’d be spending around $280 just for Apple Music and Netflix. Add in any app that needs a subscription for its pro features and you’re over the $300 for the year. Again and always, that could well be worth it for you. The issue is how the fees are paid automatically every month and when you don’t have to cut a check yourself, you forget. 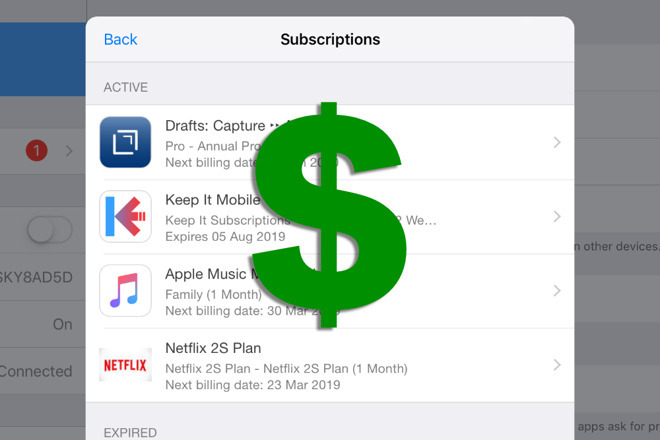 So even if you have no intention of dropping any subscriptions, take a moment to look at how to do it —because that will also show you exactly what you’re paying out for every month. On your iPhone or iPad, go into Settings and tap on your name at the top. Next, tap on iTunes & App Store, which you’ll find about midway down the screen. 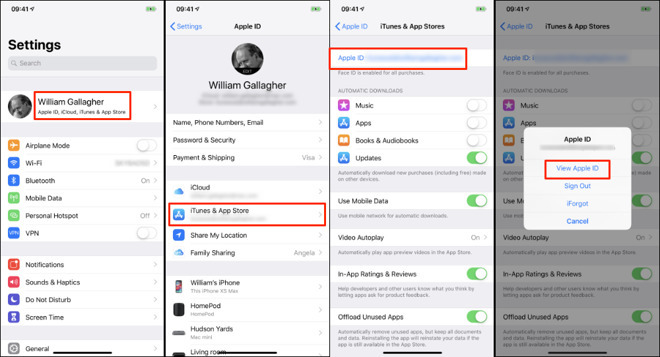 Now tap on your Apple ID at the top of the page that appears. Choose View Apple ID and let your iPhone identify you. Whether that’s through Touch ID or Face ID, depends on which iPhone you’ve got. And so does this. On an iPhone XS Max, the Subscriptions button is at the foot of the screen. You may well have to scroll down to get it on other iPhones. When you do, tap it and you’re into the subscriptions page. There may be two sections here. One is to do with subscriptions that have ended. So if you’re wondering why you suddenly don’t have Netflix or some other subscription, see if it’s listed in the bottom section, the Expired part. The more useful section, though, is the first or Active one. 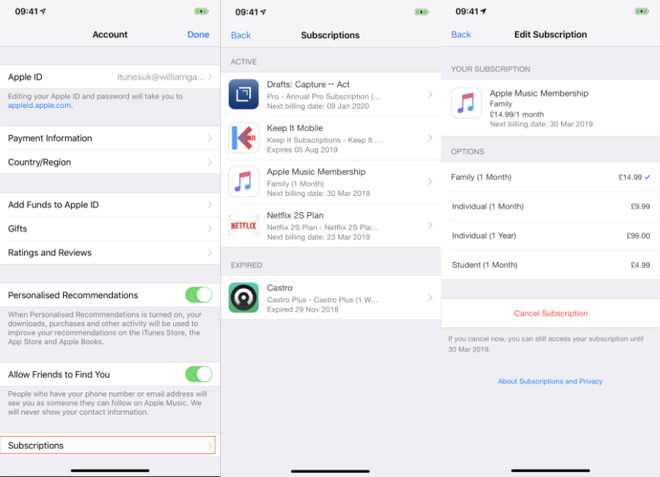 This shows you all the recurring subscriptions that you’re paying out for via the App Store. It only tells you the title, however, with the briefest of descriptions and when your next payment date is. Tap on any entry, though, and you can see more. While every subscription is different, the way you use them is identical. Each one has a list of prices for your territory and there will be a check mark next to the one you’re currently paying. You can change this to any of the other fee options available or you can tap on Cancel Subscription. If you do that, your subscription moves to the Expired section and you’re done. One poor thing is that there’s no way to remove the Expired subscription from this list. But equally, one good thing is that if you change your mind, you can tap on any entry there and resubscribe right away. This is all about managing your subscriptions. That can mean cancelling some and renewing others you long ago dropped, but really it’s about knowing what’s going on. Know where your money is going every month and you’ll be in control of what you choose to spend it on.